Makeup and Modifieds: It's Beautiful to Stand Alone. 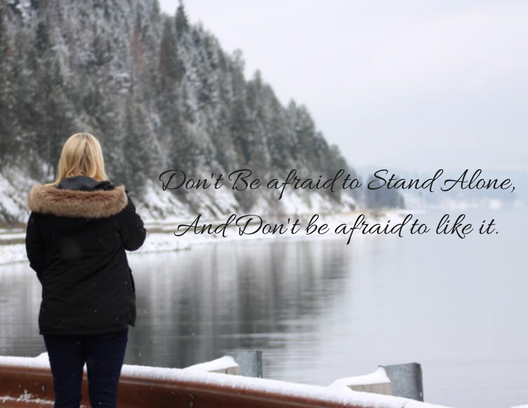 It's Beautiful to Stand Alone. There's an exact moment when you realize that it's perfectly okay to stand alone. 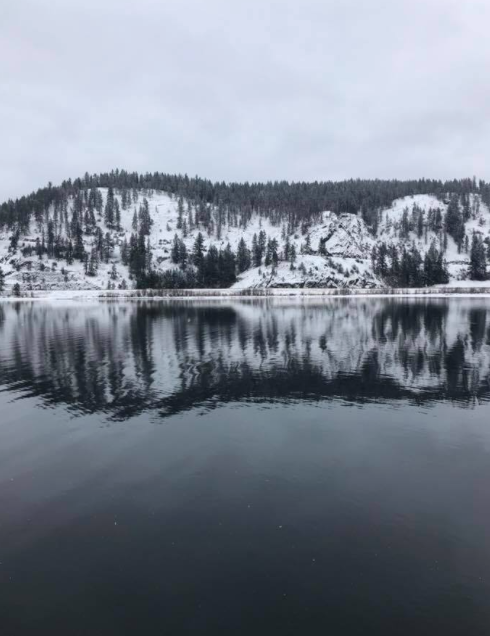 For me, it was when the crisp, ice-cold air hit my lungs as I was standing in a pullout off Highway 97 at the edge of Lake Coeur d'Alene//Wolf Lodge Bay in Coeur d'Alene, Idaho. We had driven about 10 miles from the heart of CDA around the Lake on Highway 90. I had lost my breath around mile marker 2. No, altitude wasn't the problem. It was the white painted mountain side with droplets of green pine. It was the fog as it hugged every bend and turn along the Lake. And it was the reflection of eagles as they flew above a glass like lagoon. Transcendent is the only way I could describe it. I stared longingly out the window, just waiting to get out of the car so we could get lost in the snow covered hills. *key "Landslide" by Stevie Nicks* Speedracer was in the front seat taking as many pictures as he could, my parents pointing out trails they had hiked down. And my nephew, cozy in his car seat asleep; not even aware at the magic going on around us. As soon as the car stopped I jumped out and ran up to the edge of the cove side. There were about 30 or so people with their cameras, discussing the eagles and looking for them up in the trees. But then there was me, even through the whispering conversations and various camera clicks. It was silent. There was no movement around me, not even an eagle disturbed time. Snow flurries were dancing around us - slowly as if they were doing a ballad from the nutcracker. The wind was present but only at a distance and all you could hear was the muffled sounds of the pines waving from side to side as eagles took flight passed them. From across the resevoir was the picturesque mountain side with lonely, still waiting boat docks. Eventually you'll hear the call of an eagle and your lingering gaze moves upwards. And a sense of harmony creeps in. It's a breath catching experience. A gasp for air and then a giant exhale of stillness followed by an inhale of infinate gratitude. and you realize you're standing alone. and you realize that it's okay. I've explored this idea for years. A Decade even. Maybe longer. I've never really been the one who felt the need to have a large quantity of people around me in order to feel happy or an equivalent. The ability of knowing I have a loving family and now dreamy husband who are easily my best friends has always been enough for me. I never needed to always be out on the weekends, I never needed to constantly be surrounded by people. Maybe I'm a loner. or an introvert. Or maybe I'm Independent. Even when I find myself surrounded by others I always feel disconnected from the group, like I'm an imaginary bend in the circle of conversation. And I'd often feel like the stand in, like the chorus member pulled from the background to be a stand in for the ensemble until the original member returns. This usually makes for a pretty high inheritance of disappointment. But, the one who stands alone was always the outcast, the weird one, the anti-social, the misunderstood. Every teenage-aged movie teaches us that this isn't the person you want to be because it calls for a lonely existence. But if you stick it out, you'll realize that this character is actually the happiest. They are the dark horse And the most alive. Thus, I began exploring the idea of standing alone. And here is a few things I've learned along the way - these silent moments of clarity. You don't need anyone who doesn't need you. Take the High Road, It's Less Crowded. Standing Alone is Better than standing with the Wrong People. You learn your own inner strength. You learn self-acceptance and Self-awareness. You Learn to Live with others but importantly you learn to live with yourself. You become confident in who you are. Your Battles become your victories. You Become Unstoppable. You become aware of your gratitude. Silly things you once thought were important are less important than what's actually important. You learn that aloneness doesn't mean loneliness. You are more comfortable in supporting your own decisions. You become more mindful. You appreciate the people who prove to want you and need you in their life. You become fearless. You learn to hold your own. You learn the art of being humble. You learn to trust your own intuition. The small things and quiet moments make you happy. You See the world in a different light. Driving away from the Lake gave me a very subdued feeling. A heavy sensation was in my heart as I knew it may be a while until I saw the lake again. A curiosity of where the eagles would fly to next and would boats be harbored next time the lake and I met. Could you still see a reflection in the water? Would my reflection be the same? Would the lake have the same stillness and would fog be hugging the bend? What becomes of the Lake when the winter has passed? These are all questions that have surfaced since we've left. Questions that made me cry all the way to the airport to our flight back home. Home. It was a weird feeling going "Home." Because I have never felt so much at home than when I was standing alone at the Lake in Coeur d'Alene. I understand now the beauty in standing alone. And now, all I'm left with is the urgency to return.